For some people, ‘bucket lists’ include seeing New York or learning to ride a horse. Now, ever a person to come up with my own version of something, I decided to set myself an epic quest. 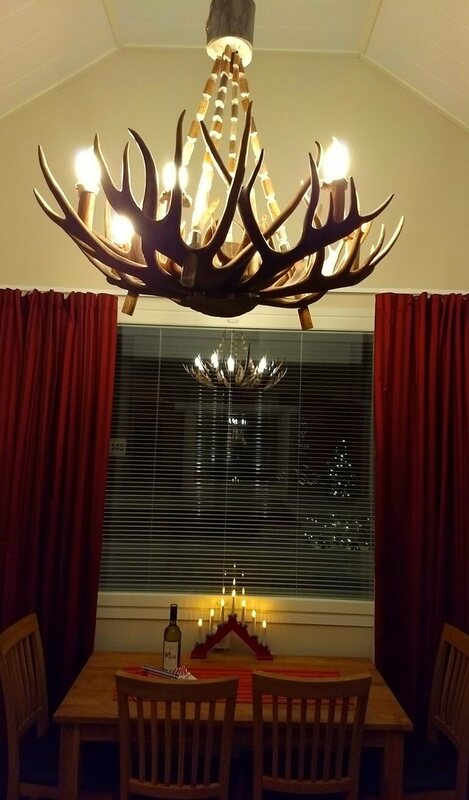 Essentially, it’s a bucket list, but less death-oriented. Amongst seeing leatherback turtles in the wild and hiking to Machu Picchu, visiting the Arctic Circle and potentially witnessing the Northern Lights was high on said quest. 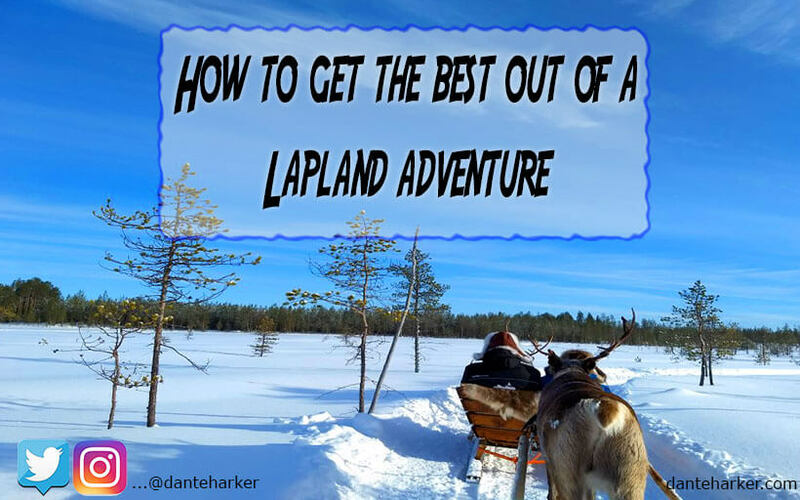 One lucky January day, we were offered the chance to visit Finnish Lapland and see what all the fuss is about and let me tell you, it’s a place like no other. Nestled between Sweden, the Baltic Sea and Russia, Finland is famous for quite a few things, from sublime seafood to heavy metal and from the famous Moomins to its fascinating indigenous people, Finland most certainly has plenty to offer. For us though, a trip to the bonafide home of THE Santa Claus was what our hearts desired. 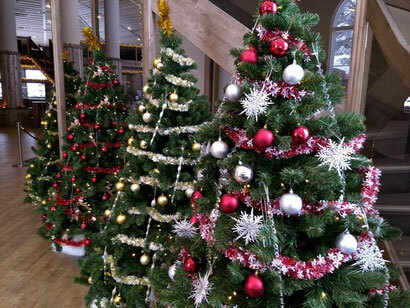 For years, tourists have visited Lapland to experience that magical ‘Christmas all year round,’ and with picturesque snow, friendly locals and no end of jolly seasonal activities, heading to this unique part of the world is a dream come true for die-hard Christmas fans. The Arctic Circle is in the northern part of the country, so our trip begins in the city of Rovaniemi. With a population of only 62,000, it is by no means a teeming metropolis, but the whole place is buzzing with activity; most of it with a yuletide vibe. There are regular flights from Manchester to Helsinki with a variety of carriers; Finnair being an affordable option. From there it’s a quick hour-long flight up to Lapland itself which is where the magic begins. Full disclosure, by the way, we travelled as a married couple with no children whatsoever, and we loved the place…just IMAGINE how special it would be to take a family vacation to this part of the world?! 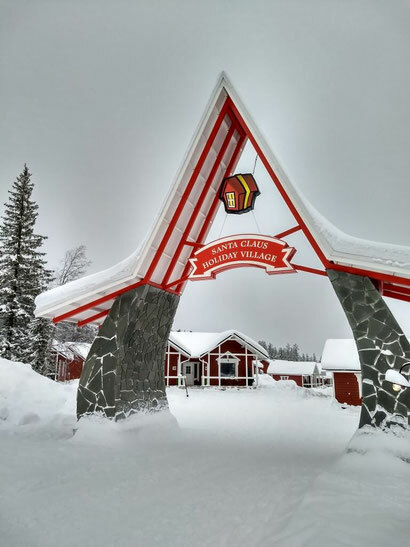 I digress; there are many options for a stay in Finnish Lapland, but far and away the place with the most charm and experience in the sector, is the aptly named Santa Claus Holiday Village. Established years ago by the very same family that owns and runs it to this day, the SCHV (we’ll call it that from now on, shall we?) 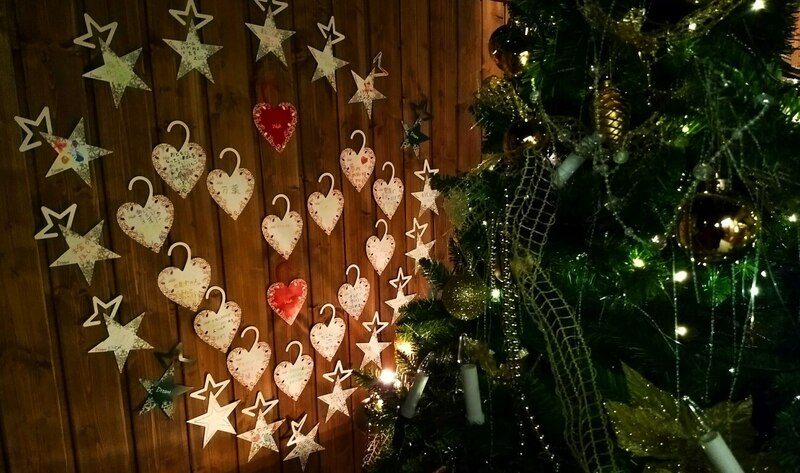 its continually grown year on year from a few cottages, to the mega-centre of holiday joy it is today. The site has some accommodation options ranging from standard all the way up to family sized cottages that cater to a full hoard of snow-seekers. A central building finished in fall 2017 has now become the cosy heart of the site, where it’s very easy to kick back and relax after a day of snow-related activities and Santa-themed festivities. 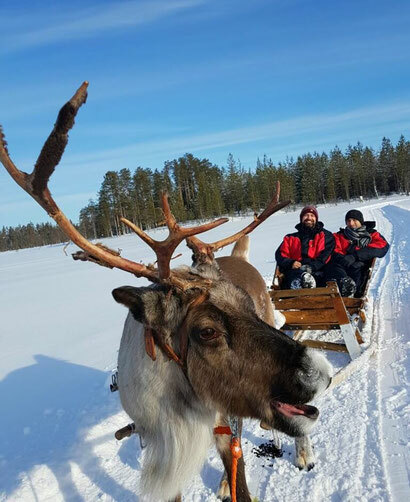 The place is an impressive undertaking with brand spanking new cottages and a growing collection of on-site entertainments to fill your time in Lapland. But while sitting around a log fire or cosying up in our posh cottage sounds blissful, we really didn’t visit for these things alone. Thankfully, there is enough to do at the SCHV to keep one entertained for a MONTH! (Another full disclosure, we only had a long weekend, so we really packed our itinerary). The chief reason families visit is for that most festive of experiences, meeting the one and only Santa Claus. I might be a hopeless Christmas fanatic, but there is one thing I am not; delusional about the reality of a man who delivers presents all across the world in one night. Nonetheless, the magic of this place (and SCHV in particular) is the way guests are wrapped up in the ‘season’ no matter what time of year. 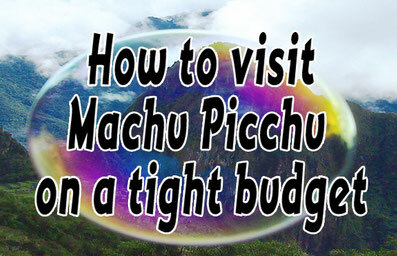 We happened to visit in March when rates are competitive, and crowds are low, which is an ideal time to come. A dedicated entertainments team and activities desk is available at all times, which makes planning excursions and day-trips very easy indeed. Naturally, a visit to Santa himself was our first port of call, and a private meeting with old Saint Nicholas is easily arranged. Christmas House Santa is right opposite the incredibly well-stocked gift shop at SCHV and getting to chat with Santa and have our photo taken was a real treat. 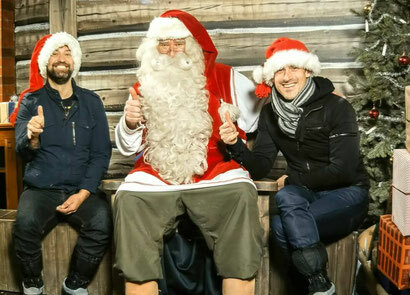 Hey, you only live once, so why shouldn’t two grown adults go sit next to (there’s no lap-sitting for adults) Father Christmas himself? Generous parents can even buy a gift and have Santa present it to awe-inspired kiddies. Coming from a pathologically cynical person, it’s a really special opportunity. It's not just bearded mythical gift-givers that people visit Lapland for though, it’s the myriad chances to totally immerse oneself in all that glorious snow. At SCHV there are a TON of things to keep days packed and full of smiles; it's only a matter of deciding what most appeals. Generally speaking, guests book an accommodation/meals deal then add on excursions like any other holiday village, but there are also super competitive packages that include some of their core adventures for visitors. 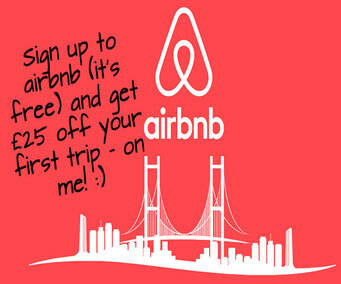 You can check them out here (don’t worry, we don’t get any commission if you click the link). So on to our packed weekend of fun! 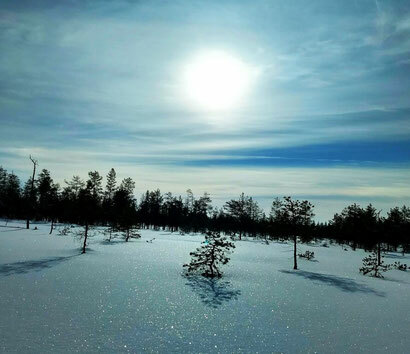 One of the best features of a snowscape like Finnish Lapland is the number of outdoor activities that provide breath-taking photos and a host of fun memories. The team at Bear Hill Husky offer some husky sled options and, witnessing these amazing working dogs at their best is a fantastic experience. Before you ask, these are true Alaskan huskies that run for days and live for the job, and not abused hounds kept chained up solely for our amusement. Our guide was the most rugged Finnish man you can imagine. He lives alone in the woods with all of his dogs in a cabin with no electricity and scant running water. 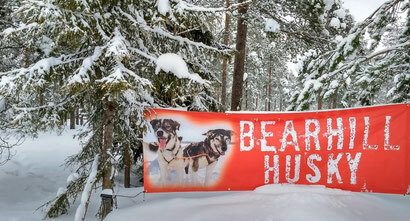 That’s right, he is TRULY the wild man of Lapland, and I can’t recommend Bear Hill Husky enough. 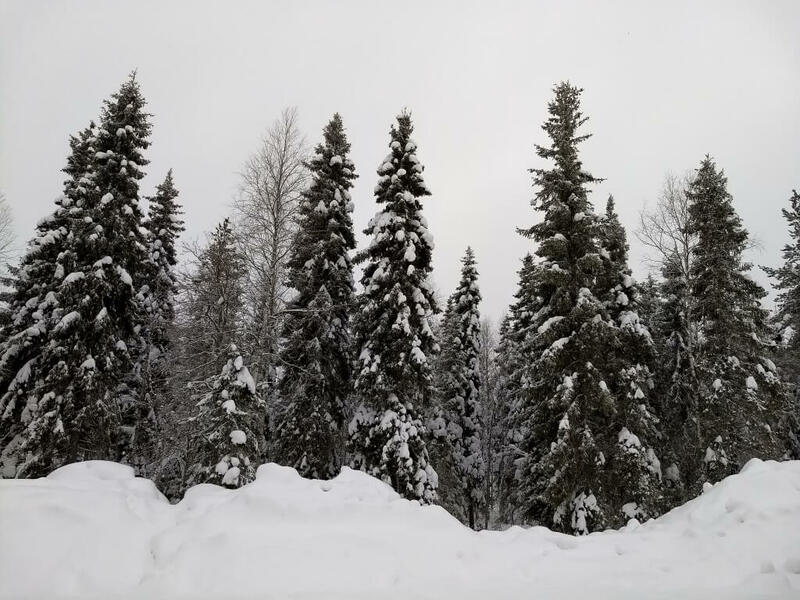 In keeping with the outdoor antics, our very first adventure on a snowmobile came at the Arctic Circle Snowmobile Park which is handily onsite at SCHV. 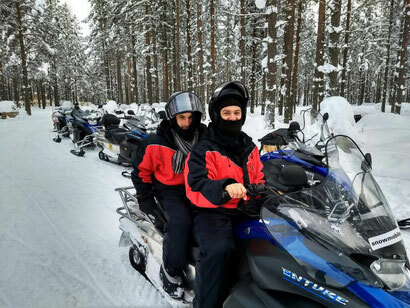 Ari, Tiina, and the team have a whole FLEET of shiny well-maintained snowmobiles just waiting for your very own scenic excursion. All one needs is a driving license and some nerves of steel. It’s an adrenaline rush, unlike most others. As a side note, they even have a mini-fleet of mini snowmobiles specifically for the little kids in your party; seeing toddlers zoom around their very own snowmobile track is a sight to warm the heart of even the coldest person. After all this outdoor fun, it’s very tempting indeed to hunker down and enjoy some gorgeous hearty food in the onsite SCHV restaurant, the Three Elves. It’s newly completed, with a well-stocked bar and a delicious menu of starters, mains, and desserts. Staying at the village for a few days means ample opportunity to work ones way through their menu. 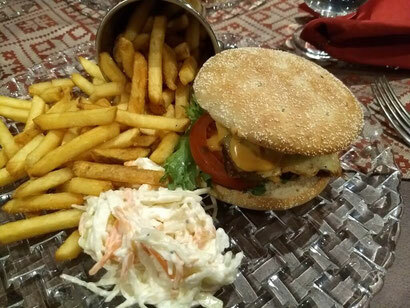 Highlights include the reindeer burger or the gingerbread parfait. As a baker and pastry chef, I like to think I KNOW a good parfait when I see one, and this one, in a coating of creamy white chocolate and served with a berry coulis is a real treat. As for alcoholic tipples (well, you’re on vacation right?) the Three Elves’ cocktail list is a great option. A particularly good one is the winter velvet; Laplandia espresso vodka, shaken with Baileys and ice and topped with vanilla whipped cream. 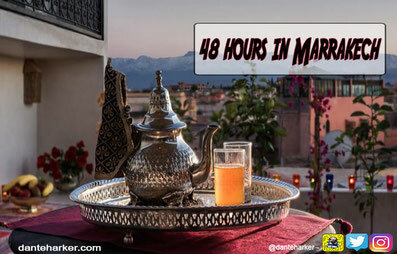 For sure, cosying up with booze is a favourite past time of mine, but with only a few days to take in all on offer, there was no time to waste. 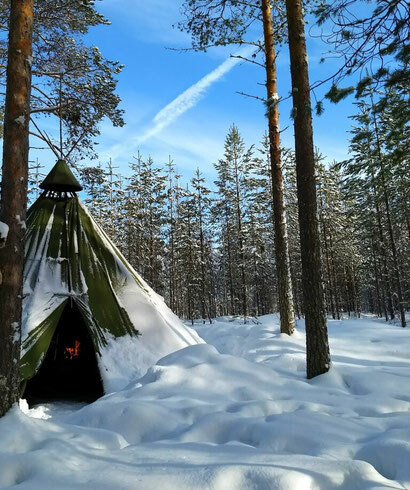 Our first experience of truly ‘dashing through the snow’ came courtesy of Christmas House Safaris and the unforgettable Veli Rekka Ollila. We got to feed Reindeer! And go on a sleigh pulled by Reindeer! And talk to Olli about the amazing cultural heritage that Lapland has to offer to tourists; hearing about the fascinating Sami way of life from a genuine reindeer herder is, for a National Geographic fan such as me, a real privilege. From sleigh-riding to ice carvings, the SCHV is also home to Snowman World which, you guessed it, is a place dedicated to the art of snowmen. A beautiful indoor museum that melts and gets re-built each year for the season, Snowman World is an absolute delight. I WOULD say that it’s a welcome break from the cold, by going inside. Alas, it is full of ice sculptures and snow-carvings which, according to science, need to be kept sub-zero to remain. For the adventurous, they even offer the option of sleeping in your very own ice hotel room, which, just like in a James Bond film, is a hotel room made, you guessed it, entirely from ice. The fully stocked Laplandia vodka bar would surely be necessary just to provide a booze-blanket! Thankfully for us, a perfectly formed cosy cottage with its very own sauna was waiting for us after each day, which is certainly more my cup of tea. There’s a funny thing about epic quests or bucket lists since, we all want to ‘tick’ these things off – otherwise, what would be the point of the list in the first place? 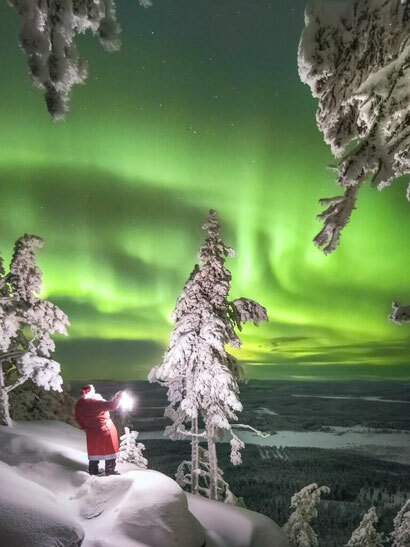 For us, one of the major reasons to visit Lapland and indeed, SCHV, was to witness the Northern Lights or Aurora Borealis; that alluring and baffling display of cosmic green light that dances over this part for the world most of the year. At SCHV, guests can enjoy Aurora hunting trips into the woods (less light pollution, better viewing potential) almost all year round. Alas, the weather is an unreliable mistress, and with too much cloud cover, the Aurora was not showing up for us. So, it remains on our epic quest. This is no disaster for us. In fact, seeing molten lava spewing from a volcano had been on our quest for years and, after at least two failed trips, we finally ticked that one off at Erta Ale in Ethiopia. Until next time, Aurora! Joyfully for us, there really was enough spellbinding adventure to be had at SCHV to more than make up for this; from our massive buffet breakfast each morning at the Three Elves Restaurant to the snowsuit antics of being children again and sledding down massive hills of fluffy white snow. Our generous host Mia accompanied us for much of our lovely stay at SCHV, but as a last day treat, we took a little trip to Rovaniemi itself. For a little taste of city life, it’s a quaint place with a lot of character, not to mention, plenty of places to hunker down with hot drinks to escape the blistering cold. One such place to pass the time includes the fascinating Arktikum. Based on the riverside, this little gem of a museum holds all the usual Museum displays of local custom and traditional garb, right up to some really interesting modern design and craft installations. 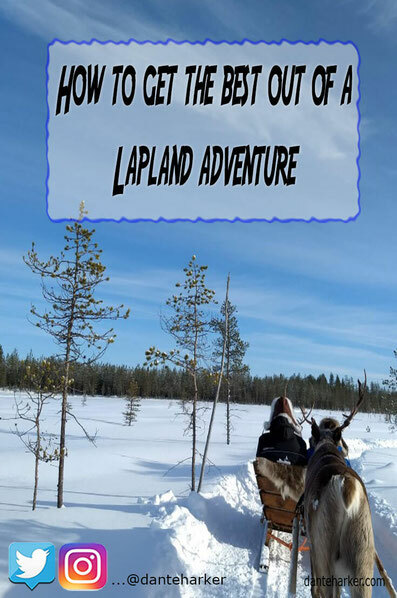 As well as insights into the rich and diverse way of life that has existed in Lapland for far longer than Santa and his Elves. Our final night had arrived at SCHV, and as a fond farewell, we decided that a proper taste of real Lappish food was required and what better place than at the fabulous restaurant Nili. It’s part of a small Finnish chain established in 2006, but do NOT let that put you off! This particular place, on Valtakatu 20 in the city centre, is an ode to all things Finnish, yes, but particularly, of the staples of Lappish diet. The interior is lifted DIRECTLY from your dream of a rustic cabin in the Finnish wilderness, but the food and its presentation is anything but. A wholesome menu of fish and game all locally sourced plus, traditional drinks to match, kept us very satisfied indeed. Having never tried ANYTHING Finnish (apart from my new favourite chocolate, Salmiaki) our time at Nili was a delicious and hearty introduction to the kind of food Finns enjoy. A starter platter of cured game meats, traditional potato bread, and Lingonberry Rye paired well with a boozy Rosemary scented cocktail of Bilberry Vodka, tonic and cranberry juice. 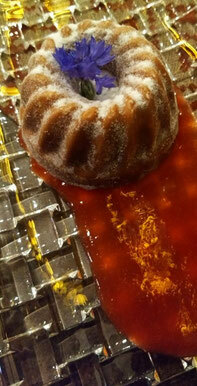 I even got food-culture brownie points for a little shot glass of bear stock. Yes, you read that correctly as Bear features in all authentic Lappish menus and Nili prides itself on the authenticity of its dishes. My main of Reindeer two ways was a glorious combination of flavours; Reindeer loin slow cooked for 72 hours felt gossamer light in texture, and the perfectly cooked flank cooked for a mere 24 hours was a real treat. Couple those with potato and nettle rosti, lingonberry reduction and a rich, gamey jus infused with tar aromas and you’ve got what I like to call a show-stopping meal. It's not just culinary wonders that make a trip to Finnish Lapland so memorable of course, but it really helps to have some scrumptious food to come into after a day of adventure in the snow. 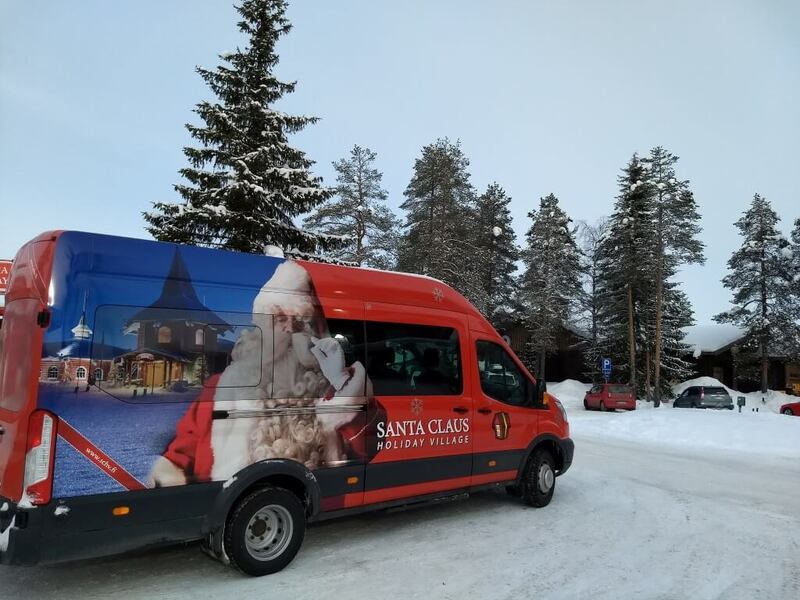 On our visit, we saw scenery we’d never witnessed before, took part in some iconic Lapland activities (Santa and Christmas carols in March anyone? ), threw ourselves into the uniquely Finnish past time of diving into snow half-naked fresh from the sauna, and also met some wonderful People. Its true what they say about the Finns, they really know how to do hospitality well, and at the Santa Claus Holiday Village, its impossible to not feel welcome. Our time in Lapland had come to an end and, as always with our trips, we packed our bags with a heavy heart. However, it wasn’t without a heap of unforgettable experiences, a very full stomach and a memory card absolutely chock-a-block with stunning pictures of a totally stunning place that in fairness, should probably be on everyone’s bucket list…or epic quest, as I like to call it. Any questions or such why not comment below or find me on your favourite social media – Twitter – Facebook – Instagram. Did you like this article? Why not pin it? You can do that very easily...go on, do it!